Strand pasta, such as spaghetti, is best served with sauces that are rich in oil, which keep the very thin pasta from sticking together. Flat ribbon pasta is excellent with rich, creamy sauces. Also, flat ribbon pasta works well with simple butter sauces. Explore the different types of macaroni described in the charts, find out how long they need to boil in water to cook, and see what they look like. Capelli d’angelo (“angel hair”) Cooks quickly, in 3 to 4 minutes The thinnest pasta of all. Cappellini (“little hairs”) Cooks in 4 to 5 minutes Slightly thicker than angel hair. 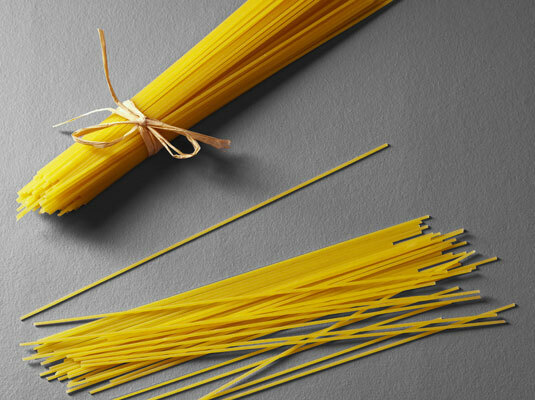 Spaghetti (“little strings”) Cooks in 10 to 12 minutes Long, medium-thick strands. Vermicelli (“little worms”) Cooks in 5 to 6 minutes Thin strands. Linguine (“little tongues”) Cooks in 8 to 10 minutes Long, thin ribbons.